Starting today, I'm adding a new feature to The Culinary Gadabout. Primo shopper Suzy Shepherd--always on the search for quality items at a value price--will occasionally write about a find geared to people who love to cook, enjoy a glass of something spirited, or take off on a trek to places far and near. Want a hearty breakfast before you rush out the door in the morning...but don't have time to fix it? I recently found the solution under the Christmas tree: a nifty and very efficient device that makes a delicious breakfast sandwich in less than 5 minutes. It's received a solid 4-star rating (out of 5) from more than 900 Amazon purchasers. No kidding. The Back to Basics Egg-and-Muffin 2-Slice Toaster and Egg Poacher really makes delicious egg/muffin (or toast) sandwiches. It also contains a tray that warms up pre-cooked bacon or sausage patties, which you can then add to the sandwich. And it does even more. The number of simultaneous functions employed with this handy 3-in-1 device is up to you. Maybe you'll want to toast bread while poaching or steam-scrambling an egg and warming up some bacon. Or maybe you'll just want to toast half an English Muffin. 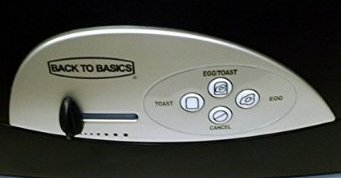 About the same size as a conventional toaster (7"x15"x8"), the BB Toaster/Poacher poaches one egg at a time (or boils up to four). Other features include light-to-dark toast settings, automatic shut-off, an easily-cleaned control touchpad (small photo), a removable crumb tray, and built-in cord storage. The Back to Basics 2-Slice Toaster and Egg Poacher comes with a 1-year warranty and only costs $34. Cooking for a crowd? 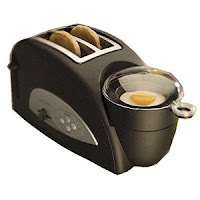 Consider the $55 Back to Basic Egg ‘N Muffin 4-Slice Toaster/2 Egg Cooker. Disclosure: If you click on a link and end up ordering something, The Culinary Gadabout will receive a small commission from Amazon, at no additional cost to you.